The combination of ruptured aneurysms with acute subdural hematomas (aSDHs) is a rare presentation. Patients with aSDH associated with aneurysmal bleeding represent a subgroup within the spectrum of aneurysmatic hemorrhage. We summarize the clinical characteristics, diagnostic evaluation, and management of a series of cases presenting with aSDH associated with aneurysmal subarachnoid hemorrhage (SAH). Medical records and surgical reports of 743 consecutive patients admitted to our institution with SAH from January 1995 to December 2007 were screened to detect cases of associated aSDH. 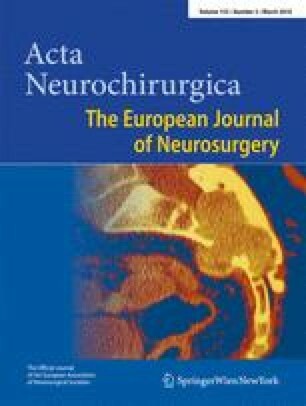 Admission evaluations included the Glasgow Coma Scale (GCS) and the subarachnoid grade of the World Federation of Neurosurgical Societies (WFNS). Radiological assessment included computer tomography (CT) scan, CT angiography (CTA), and digital subtraction angiography (DSA). The presence and volume of SAH, intracerebral hemorrhage (ICH), and aSDH were documented. Outcome was measured in terms of Glasgow Outcome Scale (GOS) and modified Rankin Scale (mRS) at 4–8 months. A total of seven cases (0.9%) presenting with aSDH (mean width: 11.2 mm ± 4.8 mm, range: 5–20 mm) attributable to SAH were documented. Three of these patients were admitted with a suspicion of trauma. Five patients presented with WFNS grade 5, one patient with WFNS grade 3, and one patient with WFNS grade 1. All patients underwent evacuation of the aSDH. In four patients, surgical obliteration of the aneurysm was achieved in the same procedure. Two patients underwent delayed occlusion of the aneurysm: one by coiling and one by clipping. Three of the seven patients recovered completely from their neurological deficits (GOS 5, mRS 0–1), three recovered with mild disability (GOS 4, mRS 2–3), and one died within 8 h after the decompressive procedure. The incidence of aSDH associated with SAH is low. Most of the patients with aSDH due to a ruptured aneurysm present in exceptionally poor neurological condition. Nevertheless, rapid surgical treatment of the hematoma and aneurysm obliteration can lead to a favorable outcome. Routine CTA should be performed in all patients presenting with an aSDH associated with SAH and no clear history of trauma. In non-comatose patients with aSDHs associated with SAH, it is of utmost importance to get accurate clinical information regarding the symptom onset and co-morbidity, including possible anticoagulation therapy. Small amounts of blood may be seen relatively often in the subdural space in patients with massive SAH, but large hematomas necessitating removal per se are rare. The history of typical symptoms of SAH together with blood is SA and subdural space with no trauma history naturally indicates aneurysmal origin in most cases, and for anatomical reasons ICA-PCom being the most common in the present series and literature. CTA is replacing DSA rapidly in primary aneurysm diagnostics in many centers as a non-invasive and quick method. As the authors conclude, it should be performed with a low threshold to exclude aneurysmal origin when in doubt, especially in comatose patients presenting with aSDH associated with SAH, possibly with no previous medical history available on admission.